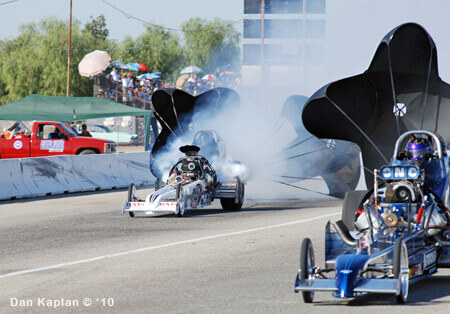 Bakersfield, CA - 10/18/10: The 19th CHRR was a rough outing for the High Speed team as they had gremlins, expensive gremlins all weekend. 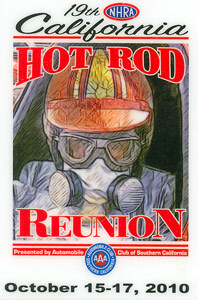 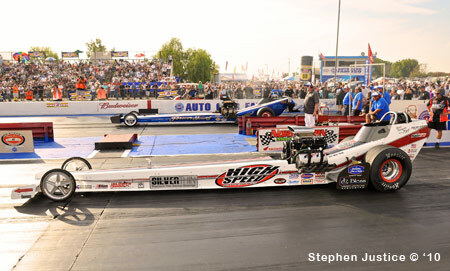 Unlike their win at the National Hot Rod Reunion in Bowling Green in June, not much went according to plan here. 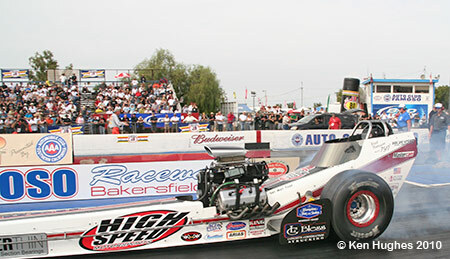 Coming into the event driver Brad Thompson was sitting in the #3 spot in the 2010 NHRA Hot Rod Heritage Series points race, just 27 points behind the leader. 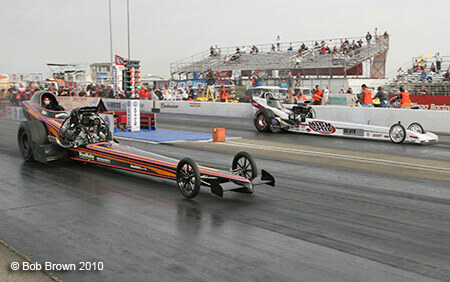 Try as they did they could not overcome the points. 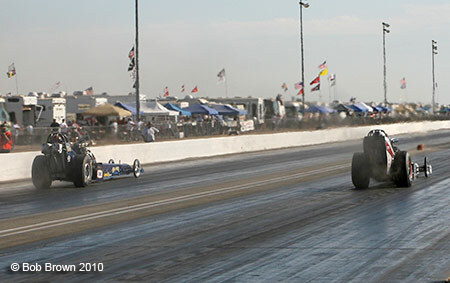 The two cars in front of them kept winning and in fact the eventual champ Adam Sorokin beat Thompson in round two eliminating him from the chase completely. 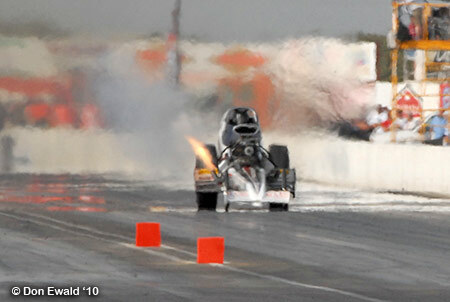 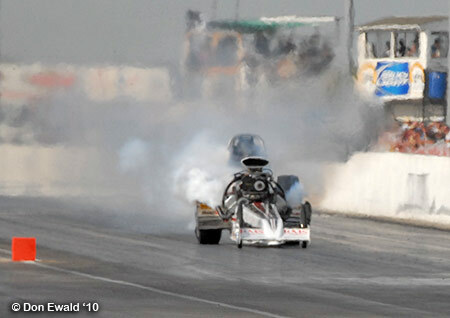 3:15 p.m. After some timely delays because of some oil downs Top Fuel finally got out for its first session. 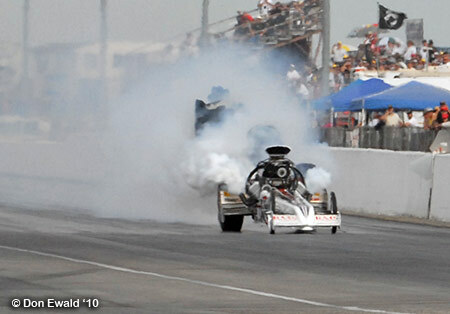 The temperature was in the low 90s which made the track groove pretty narrow. 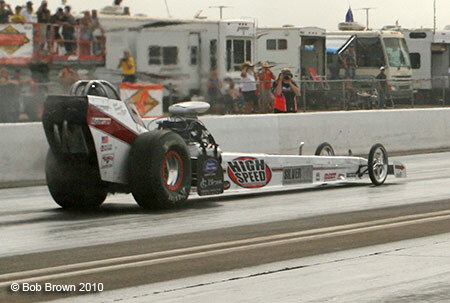 For his first shot Thompson was paired with Rick White. 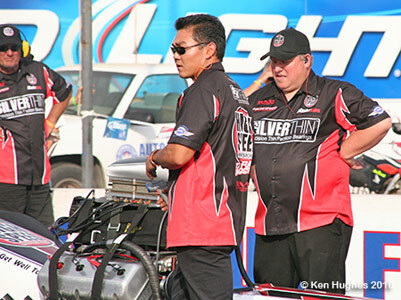 Walt Stevens backed Thompson up while Rian Kono observed the engine for any problems. 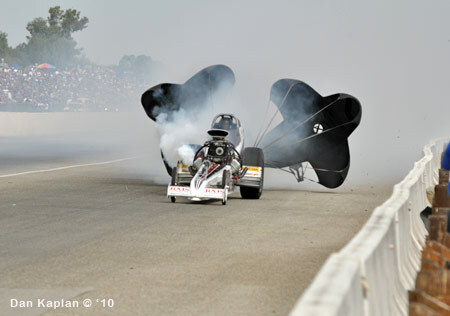 Stevens sees a fuel leak that is quickly fixed but may have led to the issues on the top end. 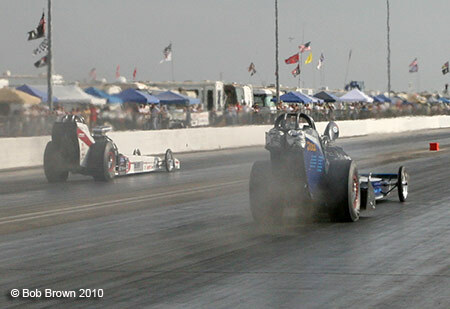 Both cars left hard and stayed together to the traps. 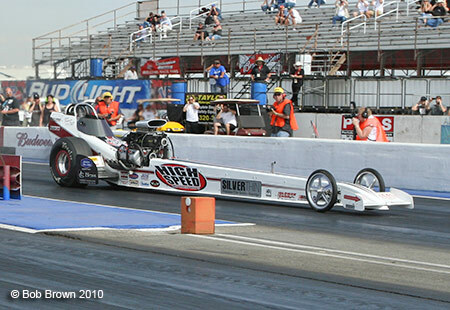 Just before the lights Thompson's ride ran out of fuel resulting in a 5.86 at 257.74 and the teams first engine loss of the weekend. 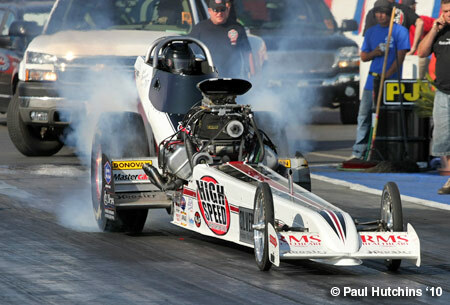 White had no problems at all carding a 5.81 at 254.16. 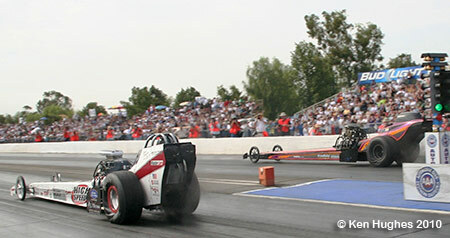 1:30 p.m. 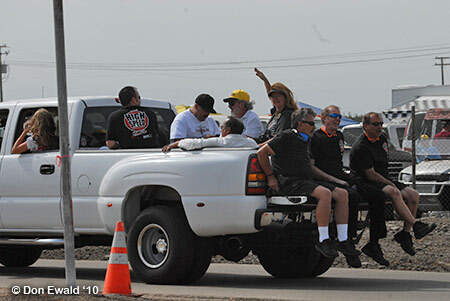 Unlike the March Meet which offers three shots to qualify, the CHRR offered only two which put the tuners and drivers to the test as they have less room for error. 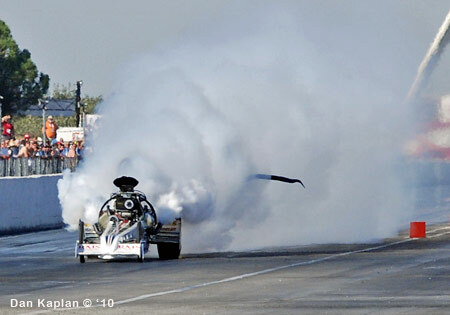 The weather remained HOT. 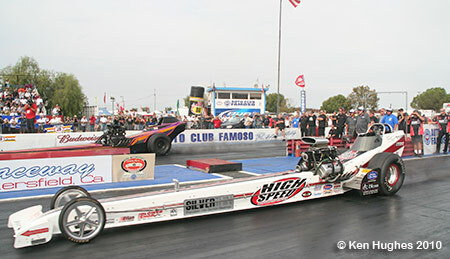 Last pair out for session two were Thompson and Jim Murphy who was #2 in the points. 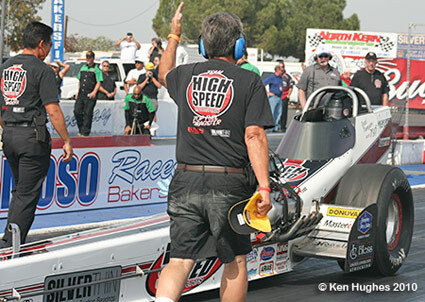 With the field set this was all about position on the ladder... not to mention a round one tune-up. 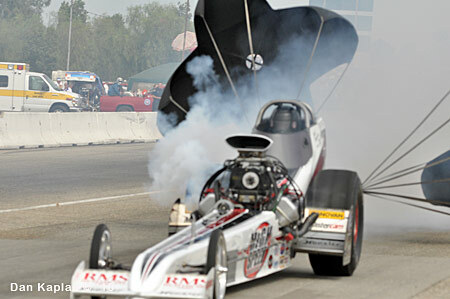 Thompson had another good launch and nearly repeated his session one numbers. 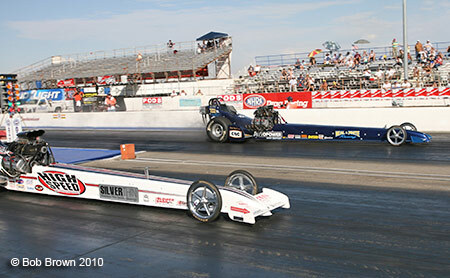 Both cars finished the session with sterling numbers. 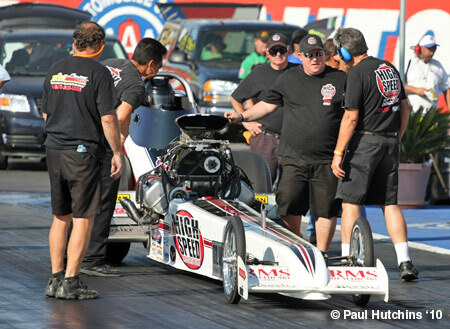 Thompson moved up to the #5 hole with a 5.85 at just 204.59 losing another engine, this time due to lack of oil. 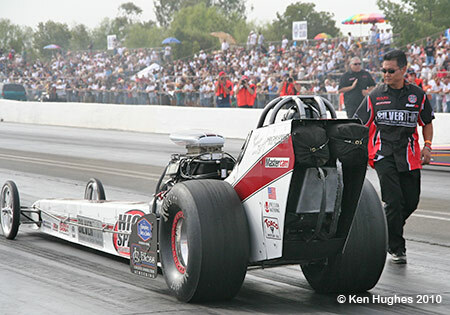 Murphy remained #1 with a 5.88 at 237.78. 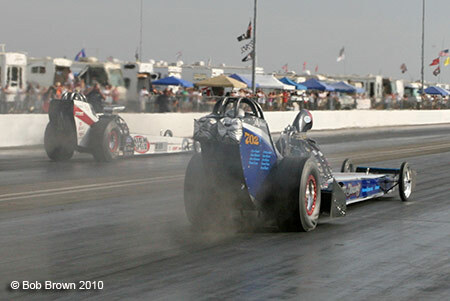 5:00 p.m. 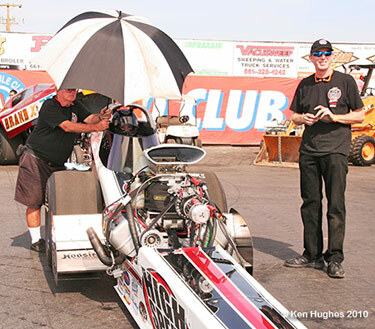 The other difference between the March Meet and CHRR is that the first round of eliminations is run Saturday prior to the Cacklefest program. 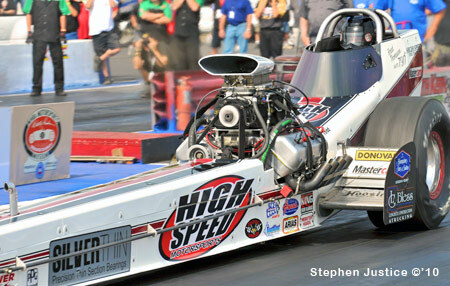 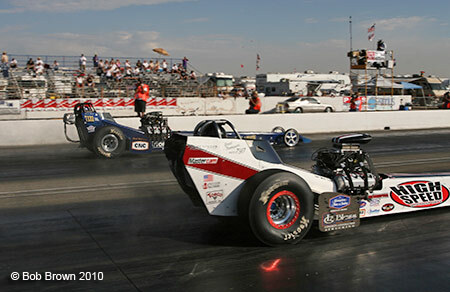 Thompson's round one race was with Mike McClennan. 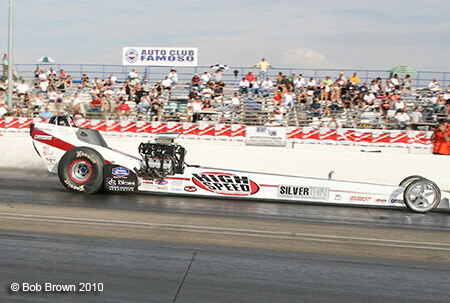 McClennan left first but was passed by the tree. 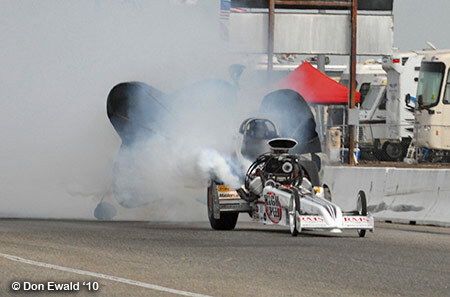 Thompson's Donovan started eating itself up at the 1000' mark. 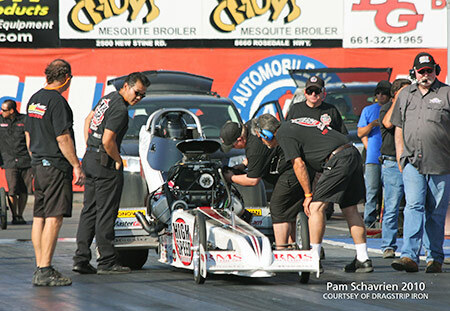 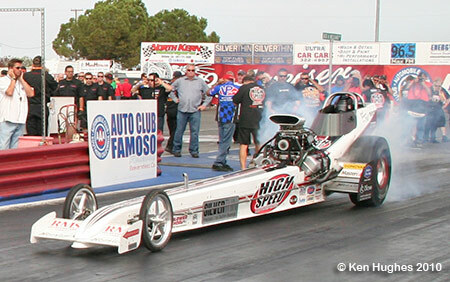 Although Thompson won the race with a stout 5.71 (low for the round) at 247.45, for the third run in a row the High Speed car suffered severe engine damage. 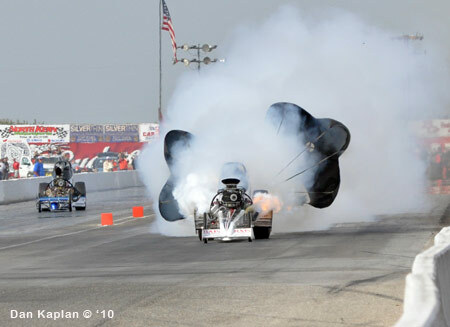 11 a.m. 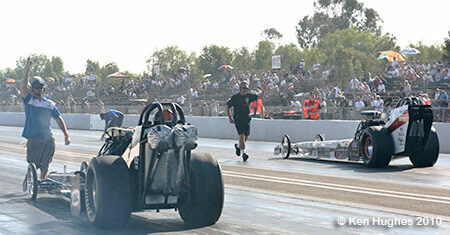 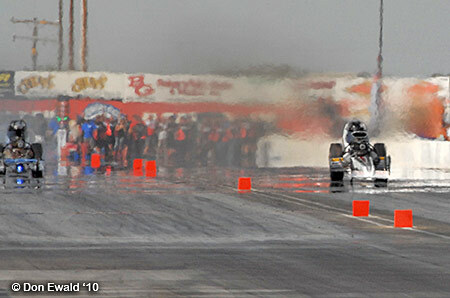 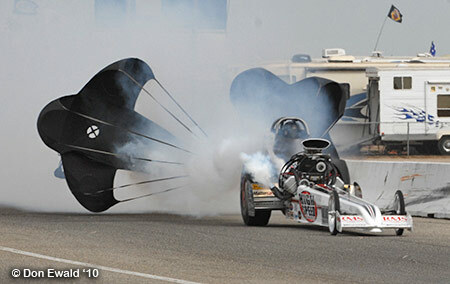 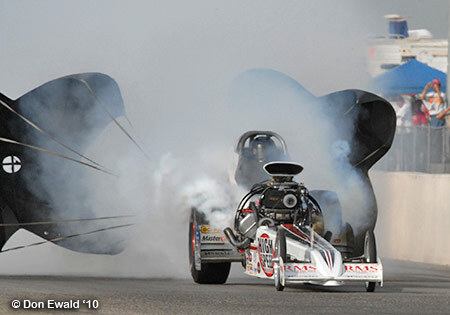 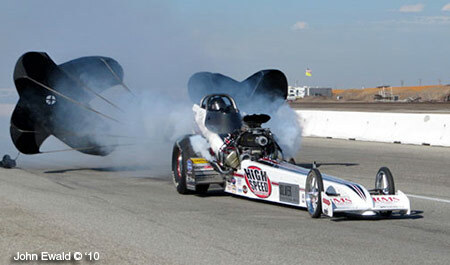 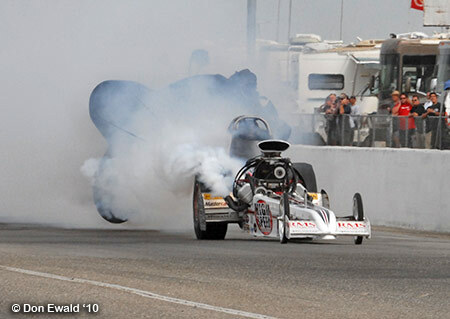 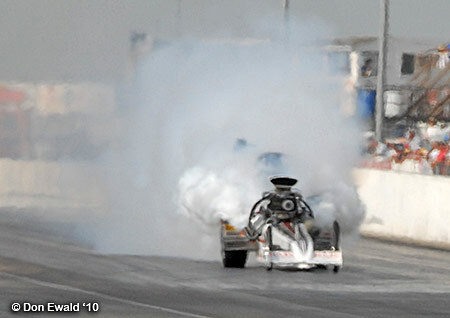 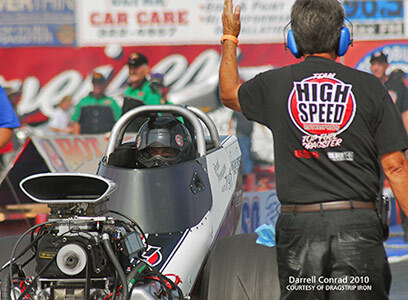 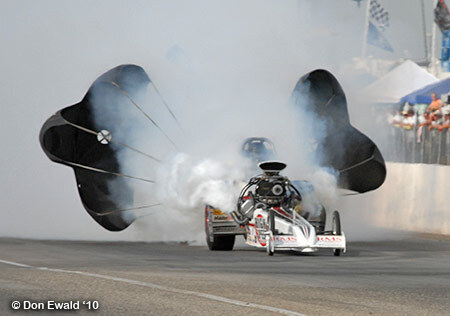 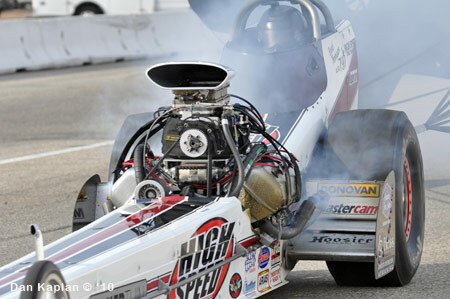 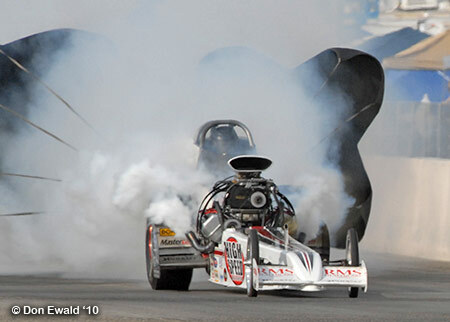 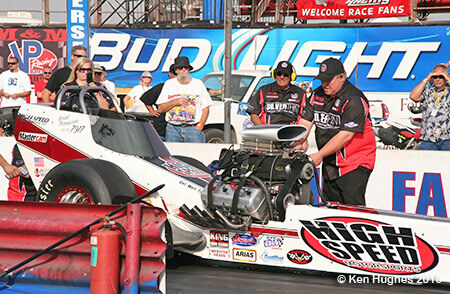 Following the pre-race ceremonies round two of Top Fuel was underway. 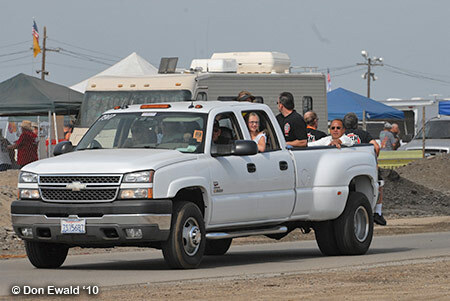 The weather was considerably cooler than the previous three days and came as a real relief to the remaining racers. 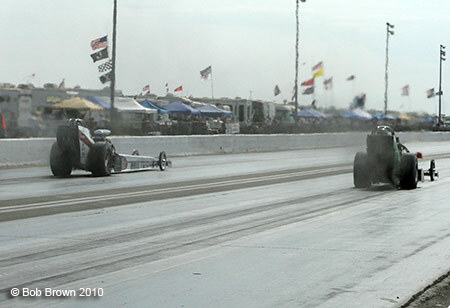 Pair two matched up Thompson with Adam Sorokin with Brad having lane choice. 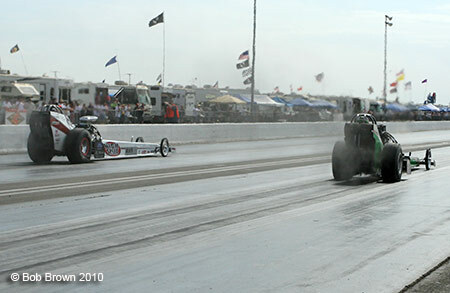 Sorokin had a slight lead off the line. 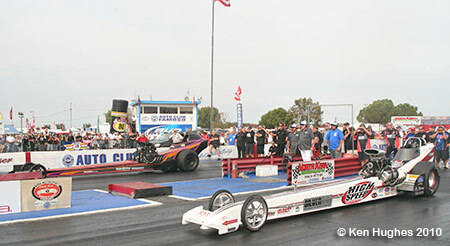 This was a great drag race with Sorokin getting the win by a nose. His 5.816 at 249.72 just beat Thompson's 5.829 at 252.10. 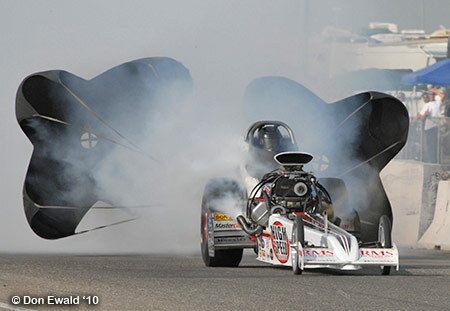 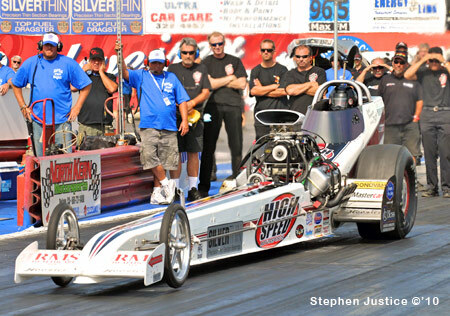 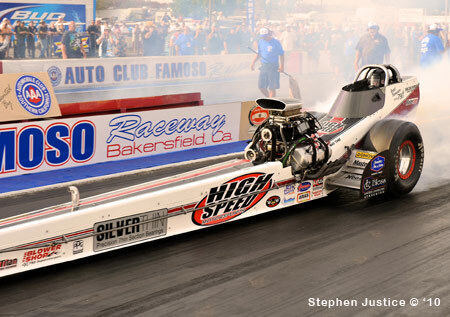 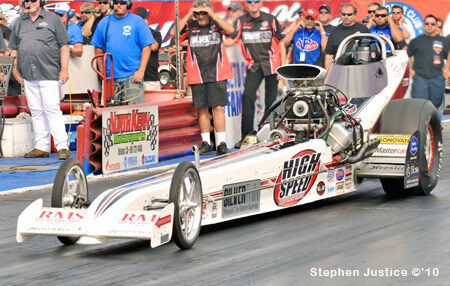 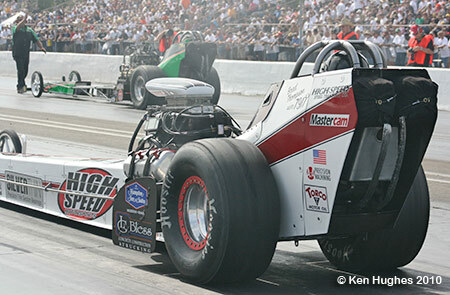 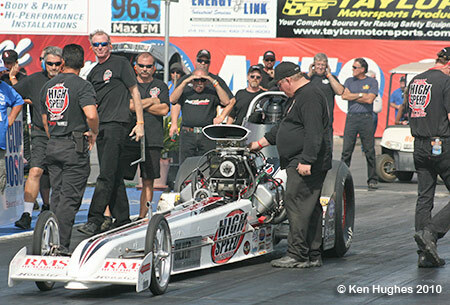 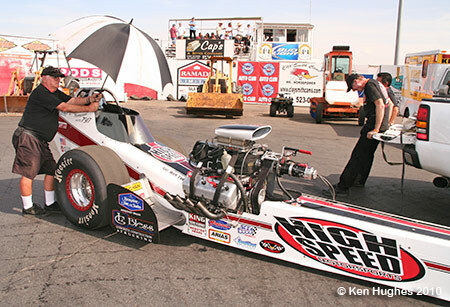 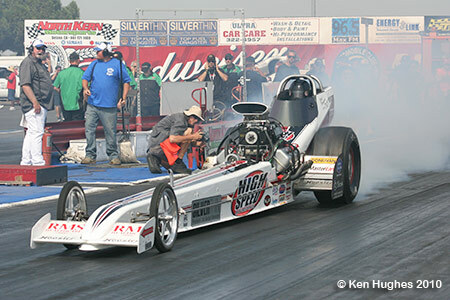 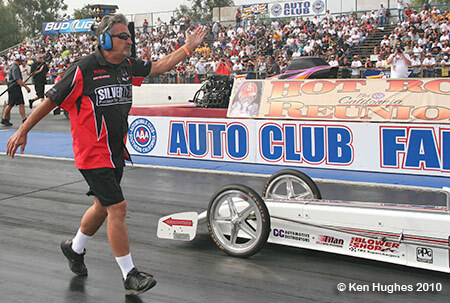 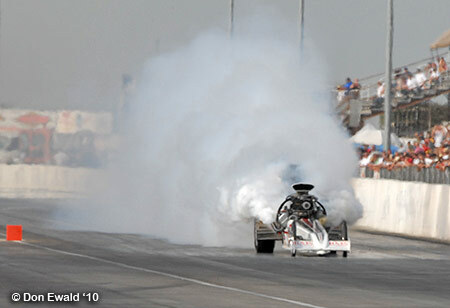 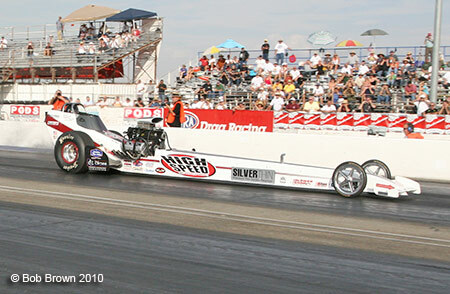 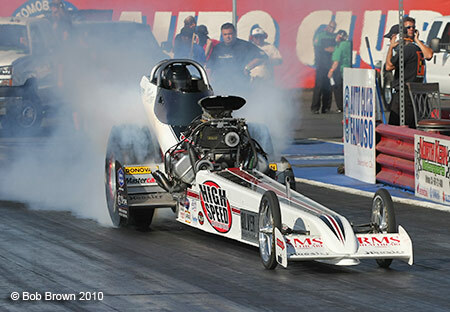 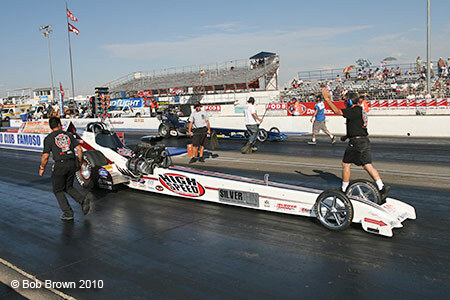 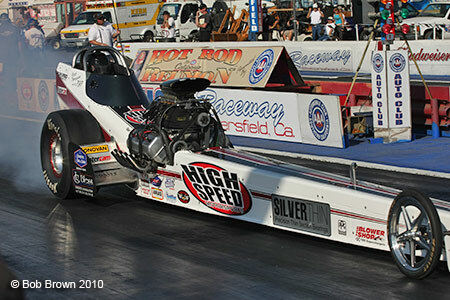 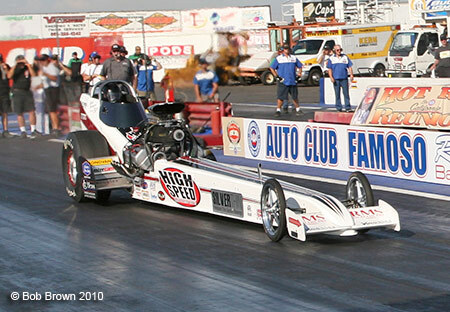 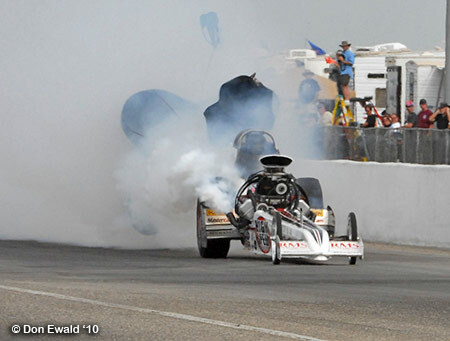 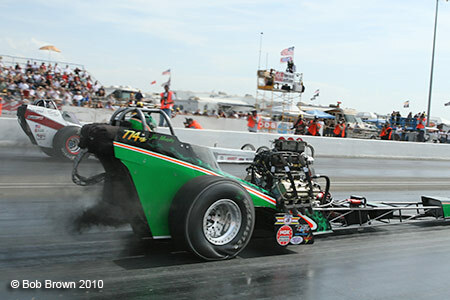 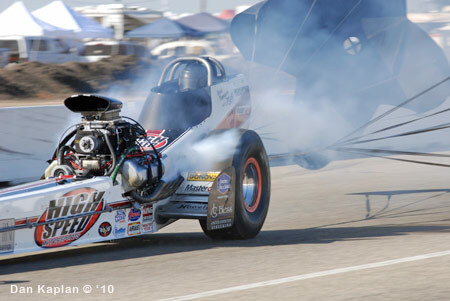 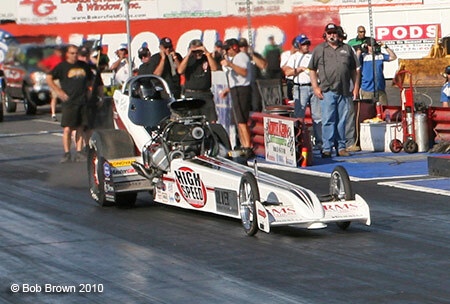 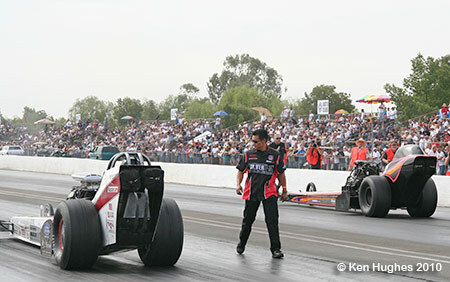 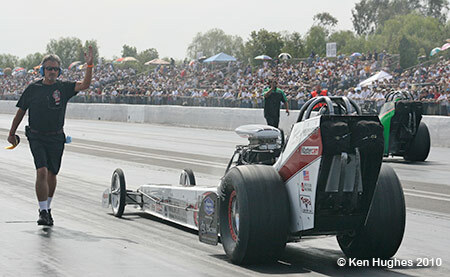 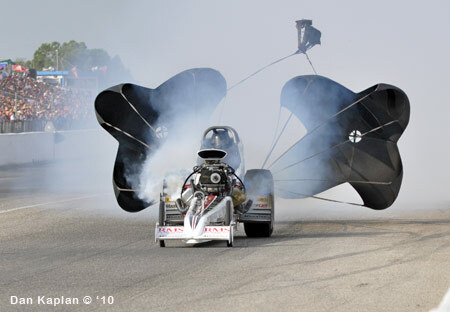 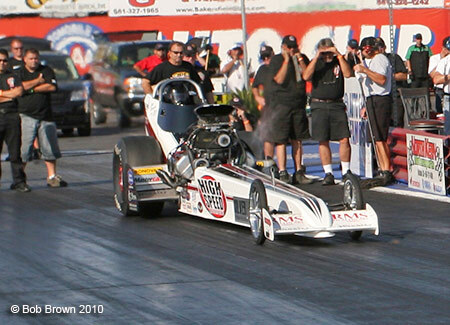 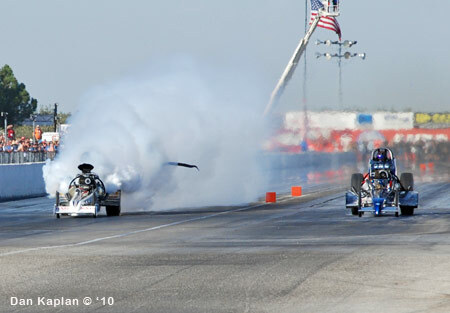 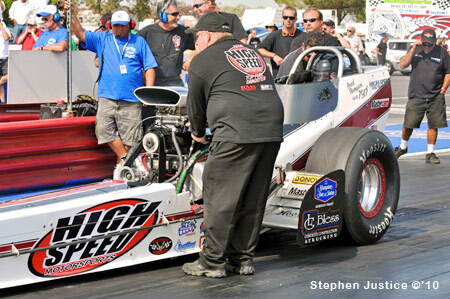 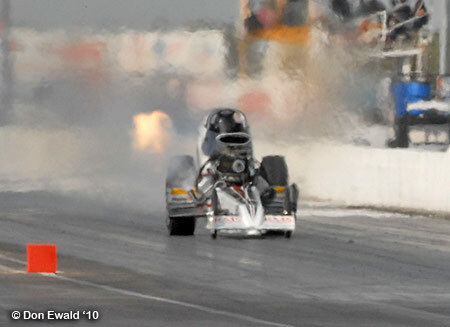 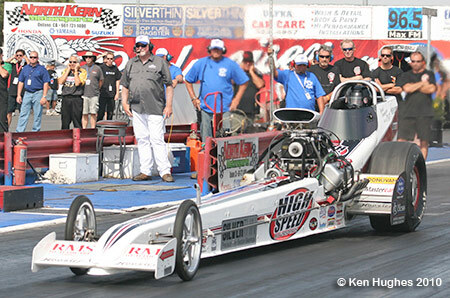 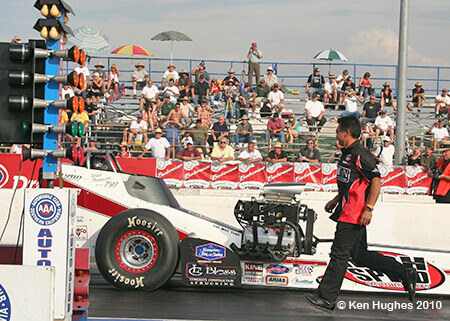 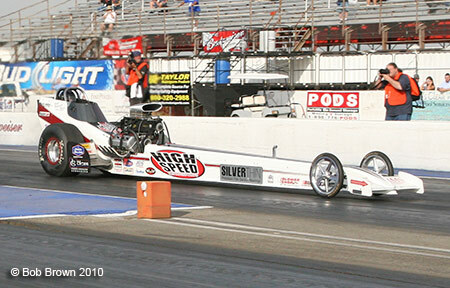 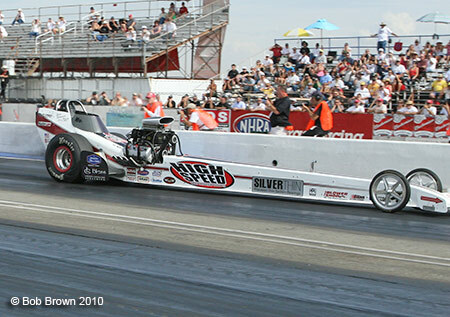 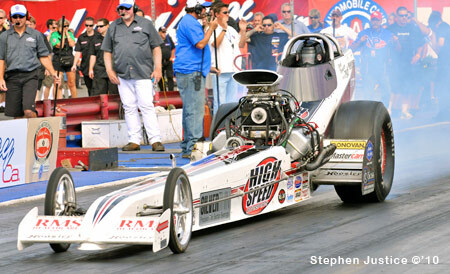 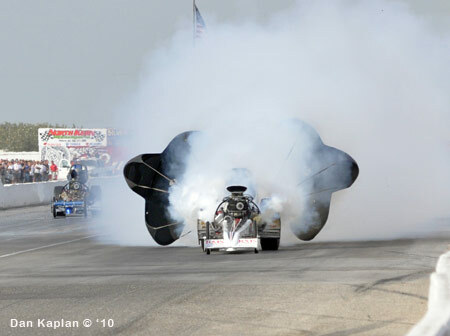 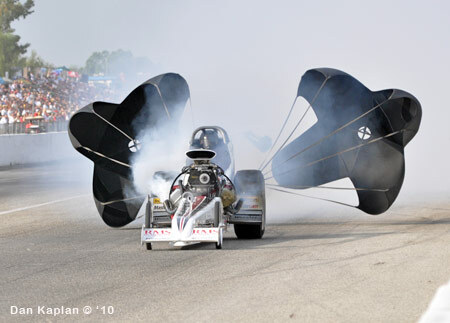 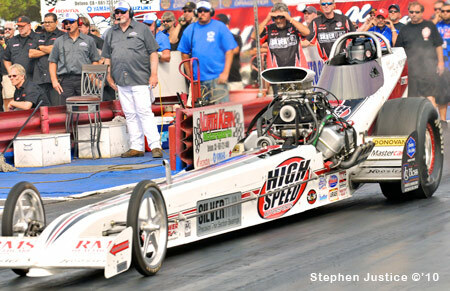 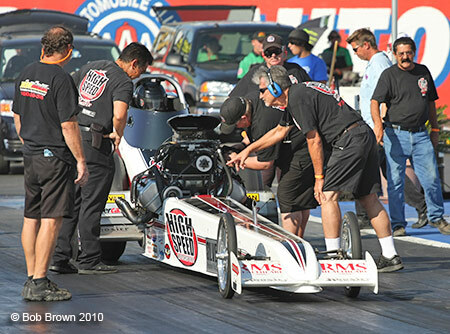 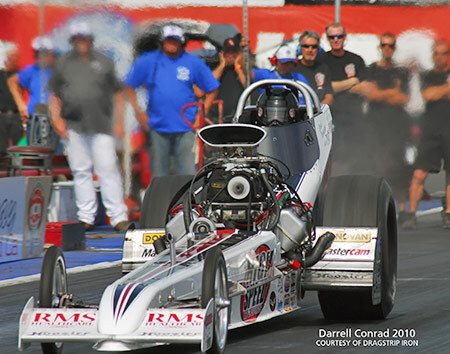 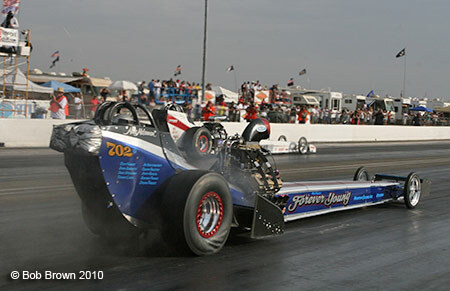 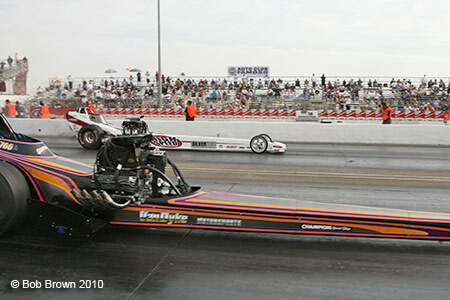 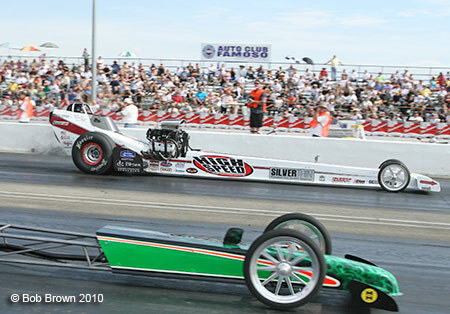 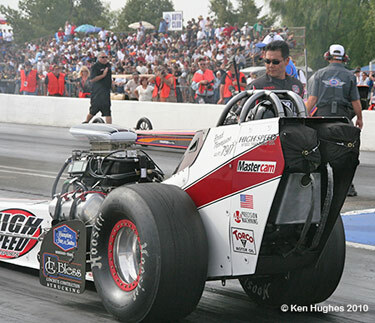 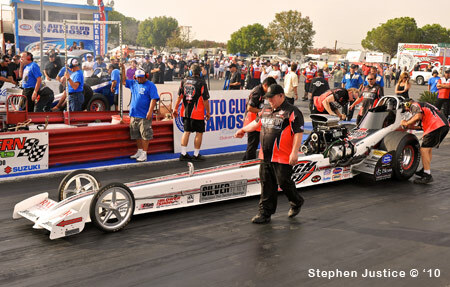 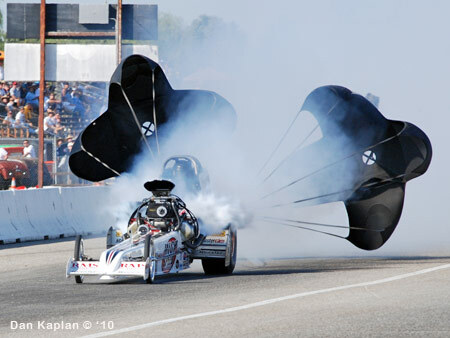 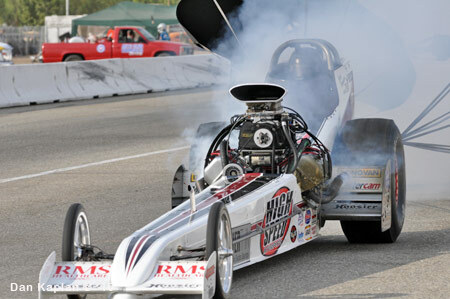 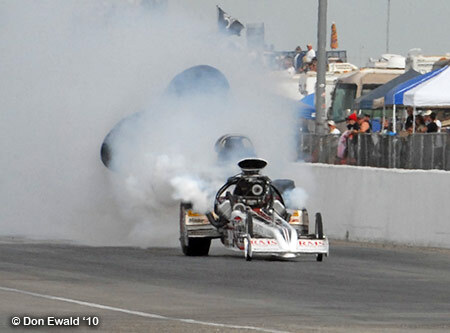 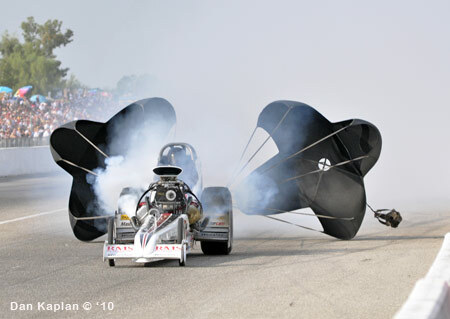 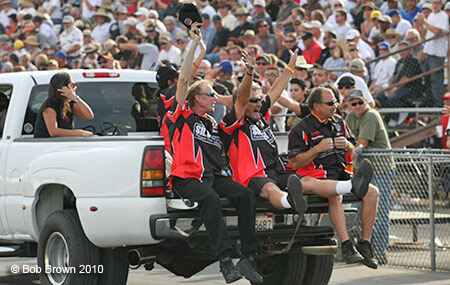 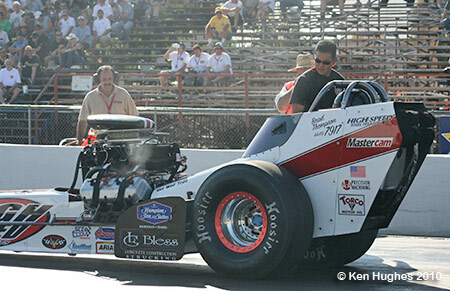 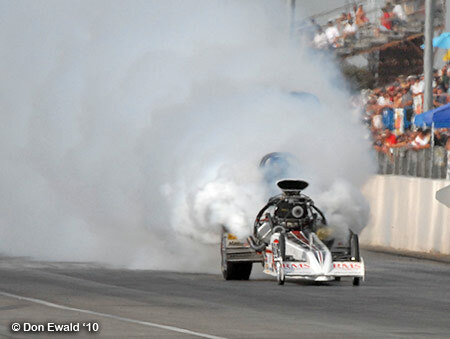 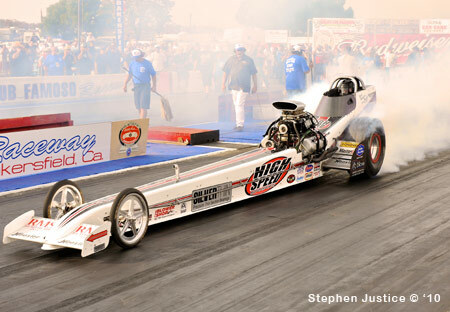 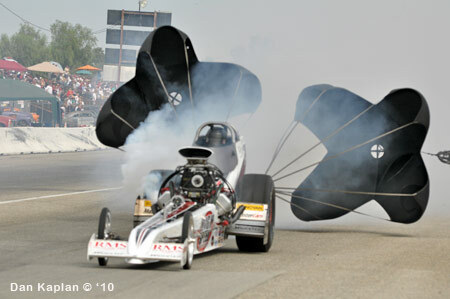 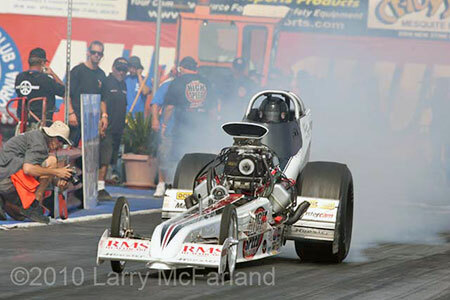 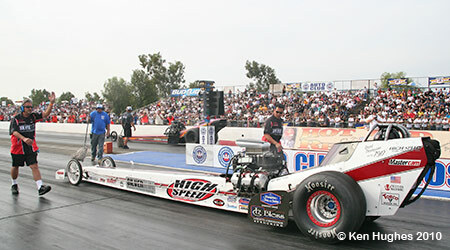 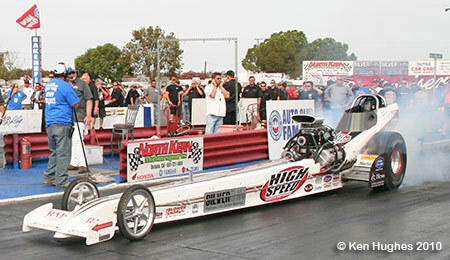 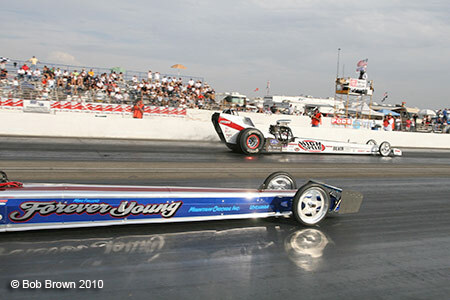 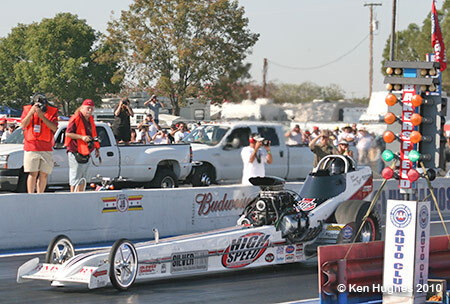 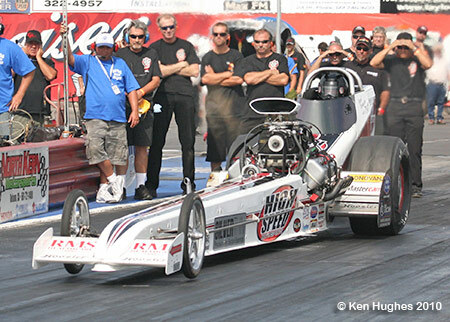 Sorokin would go on to meet and then beat Jim Murphy in the next round to win the 2010 Top Fuel Championship while Thompson and crew were sent packing looking forward to 2011.